Designing Log or Timber built homes requires a different technical perspective than designing traditional stick frame homes. 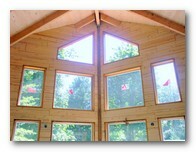 At Sing Log Homes, we have an in-depth understanding of the properties & behaviors of log & timber. This understanding can only be developed through years of education and direct experience. For over 15 years, the team at Sing Log Homes has worked with clients, contractors and architects directly to assist with the design beautiful custom built homes. 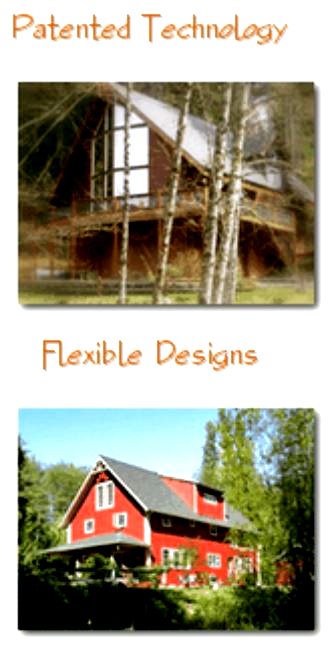 Sing Log Homes focuses on working with each client to create luxurious, one-of-a-kind homes. In PDF. Requires Adobe® Acrobat® Reader. 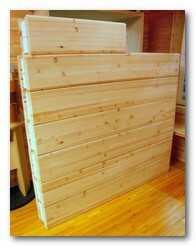 NOTE: The details are provided as general information for Sing Log Home construction. Under no conditions does any of the details represent or imply it is applicable to any specific job. All details are subject to local building code and engineering approval. Please contact us if you need referral for an architect, designer, engineer or builder in your area. The flowchart below illustrates the general steps towards having your Sing Log Home built. Point to each step to bring up a short description. Click HERE to submit any questions you might have. A – Sing Eco log with 4.5 inch thick wall, 9.5 inch tall with double Tongue and Grove and insulated urethane honeycomb for sound deadening. 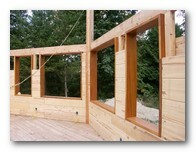 It is the easiest way to install a window, but it is also functions as a complete window sill around the window. Best of all is the energy savings, Sing window frames are the only window frames that have a built in sing honeycomb core which has high insulation with honeycomb structure for strength. Our Vertical Grain Wide-plank Panel Floor [fig-c] is an insulated 4’ x 8’ x 2 1/4 inch thick floor with a urethane honeycomb core, sandwiched between plywood or solid wood for strength and dimensional stability. It is the only insulated floor in USA. 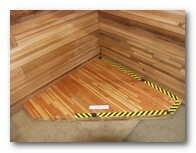 It is also the strongest lightweight floor USA. Sing honeycomb core sandwiched in between 2 pc of 3/8 inch plywood [fig-c], it is 2.25” inch thick. It is the thickest, strongest lightweight substrate in USA. Each panel measures 4′ ft. x 8′ ft. Sing Log Homes are solid and substantial homes. They need “solid” flooring to compliment them. 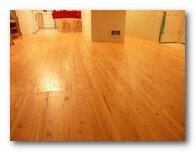 Sing Flooring is subfloor and finish floor in one. Just fasten Sing Flooring to the floor joists like subfloor, then sand and finish like any premium solid wood floor. Sing Flooring can even be exposed to the weather during construction. Sing Flooring is manufactured from laminating quarter-sawn (vertical grain) solid wood strips. 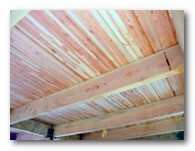 Quarter-sawn lumber offers superior strength and dimensional stability over flat-sawn lumber. Sing Flooring virtually will not warp, sag, or squeak. 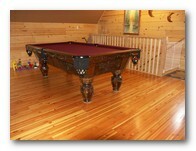 Unlike any other solid or engineered wood flooring, Sing Flooring offers unparalleled water resistance. During our tests, Sing Flooring had been exposed to the weather for 2 months (often soaked in rain) with no structural nor cosmetic damages. No formaldehyde or other toxic chemicals are used during Sing Flooring’s manufacturing. Now you can enjoy wood as a healthy natural resource. Sing Flooring is also a environmentally friendly and sustainable wood product, since it can be manufactured from much smaller lumber. Sing Flooring is comfortable to walk on. The plank’s extra thick “soft” wood construction makes Sing Flooring quieter and less tympanic than most hard wood flooring. Sing Flooring also offers more thermal mass than regular thinner flooring materials. The ability to retain and slowly release heat give Sing Flooring a warm feel and also makes it an ideal wood floor for radiant floor heating. Sing Flooring is versatile due to its strength, dimensional stability and water resistance. Now you can have beautiful hard wood floor anywhere in the house -even in bathrooms. The Sing Flooring Premium is perfect for loft or upper level flooring application -wood flooring and ceiling planks in one installation. Other applications include roof deck, outdoor decking and counter tops. 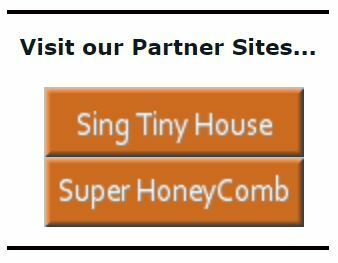 Sing logs are made with Patented Sing honeycomb core for insulation that provides a warm, natural, comfortable and energy efficient home. At the same time it is strong, dimensionally stable (less shrinking, cracking or checking than any other type of log) and easy to work with. It is simply a better way to build a better home. 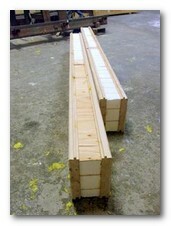 The Sing Square Log is the heart and soul of our building system. 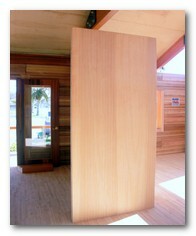 With our patented quarter sawing process, this double-wall, double tongue-and-groove square log sandwiched with patented Sing Honeycomb core for high strength, dimensionally stable and insulation for energy savings the only log that can provide function of termal mass as log home and insulation exceed conventional frame home Sing Log Home is hybrid of conventional frame home and traditional log home it has advantage of both unique home system. Simple, functional and elegant home. 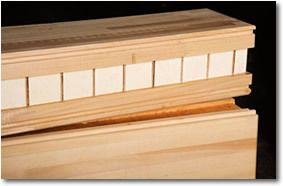 The Sing Square Log wall [fig-a] has eight-inch thick wall with 3 inch insulated Sing Honeycomb sandwiched between two pieces vertical grain heavy plank cedar or Fir it is the most straight hi precision log ever made in log home history we guarantee this claim with $1000 reward to the first person who is able to prove we are not what we claim. 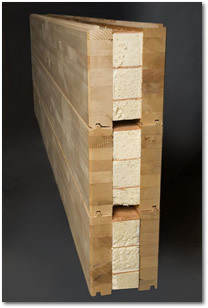 Our Sing Eco-Log [fig-b] is made of a patented 3 inch thick urethane honeycomb core sandwiched between kiln dried cedar or Douglas fir double Tongue and Grove heavy plank. 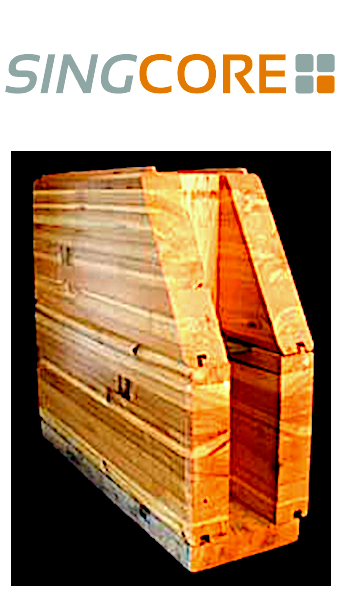 It is the most dimensionally stable, insulated, lightweight log ever designed at low cost. The Sing Eco-Log measures 6” W x 8.5” H x 8’ for easy shipping and handling It can be extended to 24’ in length at job site and weight approximately six pounds per linear foot. 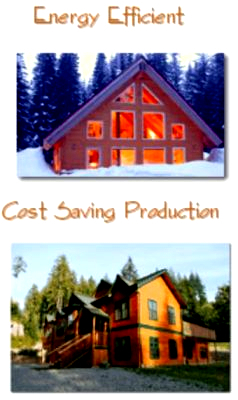 With Sing Eco-Log you get a log-home with high insulation value and thermal mass at a less cost with the same easy to build building system as the original Sing log. With Sing Eco-Log you get a log-home feel at a lesser price with the same easy to build building system as the original Sing log.